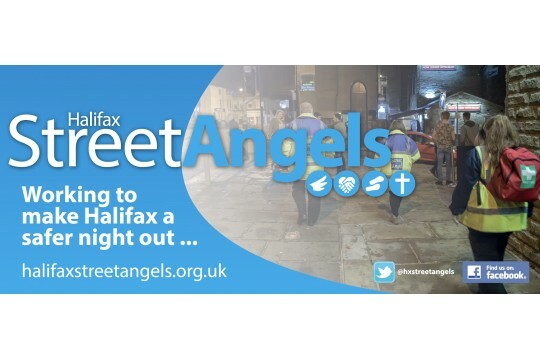 Halifax Street Angels: Operating Thursday Friday & Saturday 10pm-4am; Supporting people in need. Halifax Street Angels work Fridays and Saturdays in Halifax town centre 10pm - 4am to meet the needs of those who have become vulnerable. Violent crime has reduced by 57% over the last five years in Halifax town centre and Sexual Assaults have reduced significantly Tens of thousands of volunteer hours are invested into our town annually Thousands of people have received help and assistance - including elderly people leaving the theatre, young people who have become vulnerable in the town, those who are homeless, those who have had a few too many to drink and need a helping hand. We require volunteer Street Angels to work with us to support vulnerable people within the Halifax Town Centre night-time economy. Please contact us for more details. food and hot drinks for the homeless for an evening. vital first aid supplies for a month.